2010, Semih Kaplanoglu, 103 minutes. In the third and final installment of director Semih Kaplanoglu's award-winning Yusuf Trilogy, Yusuf is an only child who lives with his parents in an isolated mountain area. 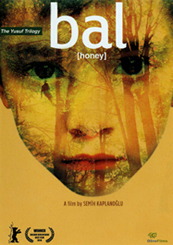 For the young boy, the surrounding forest becomes a place of mystery and adventure when accompanying his beekeeper father on the job. The strong bond between father and son cannot protect the stuttering child from becoming an outsider during his first year of school. Yusuf's anxieties escalate when his father must travel to a faraway forest on a risky mission. With his father gone, Yusuf slips into silence to the distress of his pretty young mother, Zehra. With his father now missing for days and his mother falling into a deep depression, the boy summons all of his courage and goes deep into the forest to search for his father. This final film in The Yusuf Trilogy is preceded by Yumurta (Egg) and Süt (Milk).